I am a big fan of the preggo and people with infants parking spots though! Wow.. sign of the times, huh? Yes, times are definitely changing. 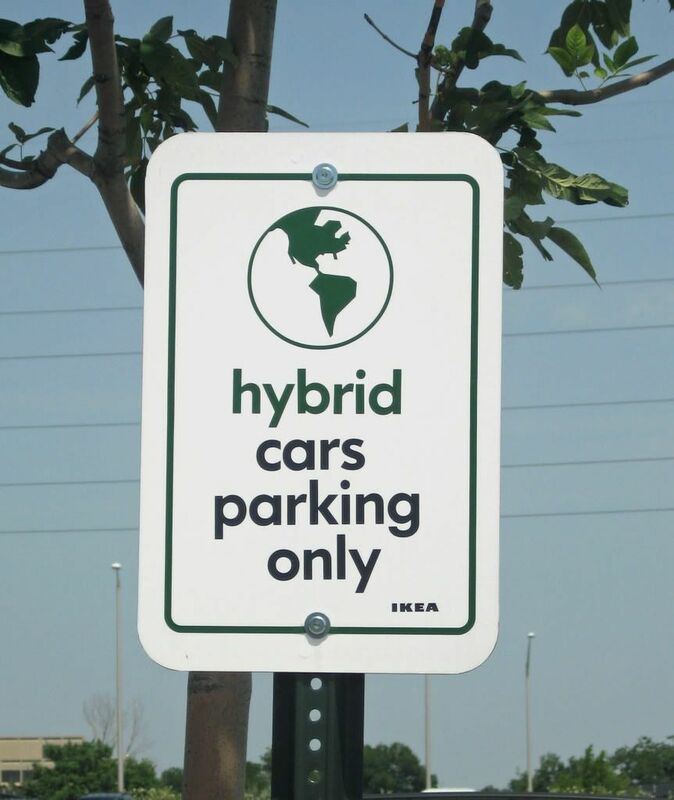 I also kinda wonder what kind of action they would take against someone who isn't a hybrid that parks in that spot... hmmm... you got my mind workin'! So, why exactly do they get special parking? I mean, I'm sure it's just IKEA's way of making a statement, but it seems a little cheesey... I wonder if we're going to start having caste system parking lots - the rich park here, the poor back there, etc. Sorry, couldn't resist the OMg moment. You went to Ikea? I love that place, but haven't made it to the one in Michigan yet. Too funny! I've never seen one of those before, and I'm still trying to figure out the purpose?? Silly! So? Ya think I'd get some looks if I went ahead and pulled my big ol' gas guzzler Yukon XL into a space like that? Although, they probably won't even see the sign over my truck! LOL!! Dare me? Oh, I wish there was an IKEA near by. However, my truck would probably be 'egged' til I got back out! Oh wait, eggs are expensive, they probably wouldn't throw them...Makes me wonder what they'd throw!?!?! I'm kinda like all grrrrrrr about the "green" movement. Interesting that people who are trying to conserve gas should get their own special parking space. Shouldn't they be walking everywhere? Lincoln is an ABSOLUTE doll baby! And girl, you look soo good, I love red on you. Next time, plan your little getaway here at our house, it would be sooooo relaxing;-)(maybe not exactly with our little munchkins).